regardless of whether I pressed the bar from the front or the back of my neck." you can work any part of the deltoid you wish." The importance of shoulders in the male physique goes all the way back to the Greeks, says Arnold Schwarzenegger. "I remember once seeing a diagram illustrating the visual impact of the body. It was in the form of an X - starting with the shoulders, crossing at the abdominals and ending at the calves. These are the areas that give the impression of male strength." One error young bodybuilders often make, says Schwarzenegger, is that they fail to realize that the shoulders are a complex bodypart. We tend to think in terms of having wide shoulders to promote a V-shaped torso, but an examination of the anatomy of the shoulders reveals there's a lot more to them than simply width. "First of all you have the deltoids. These muscles serve to raise your arms above your head. But the joint where the arm meets the torso is complex. Unlike a joint such as the knee, which has a limited range of motion and moves basically in one plane, the shoulder joint lets you move your arm around in a circle and with a wide range of motion. "Muscles are simple. They contract in only one direction. So when you want movement in several directions, you need several different muscles. Or you need a complex muscle group. And that's exactly what the deltoids are." In order to cope with the complex movement of the shoulder joint, Arnold points out that the deltoids consist of three basic heads. The technical names for the parts of the muscle groups are the anterior, medial, and posterior deltoid - more commonly, the front, side, and rear. "There's no exercise that will work all three areas of the deltoids," says Arnold. "Some work two, but not all three. Therefore, when you're planning your shoulder routine, you have to include the right variety of movements so that you get full shoulder development." Arnold has always been in favor of using poses to check one's physical progress. After all, when you pose in front of a mirror you often discover new things about your body. "Many people don't realize that shoulders are tremendously important in hitting back poses. Take the rear double biceps pose, fore example. What is it you show in that pose? Look carefully and you'll see that the deltoid development merges into the trapezius development. And the traps dominate the whole upper center of the back." Arnold has found that a lot of young bodybuilders underestimate the traps. They think of this muscle group as contributing mostly to that line that extends down from the neck to the deltoids. In fact, these muscles extend down in a diamond shape, between the lats, well down toward the lower back. "You need good lats and a good lower back, but you won't be impressive until you have also developed the deltoids and trapezius muscles. You've got to have it all for it to look right. Having just part of it won't make the grade." The shoulder girdle musculature also includes the pectoralis minor of the upper chest, but this area is normally developed through an adequate chest routine. So the main concern in working out a routine to produce quality shoulders is to employ exercises that work all three deltoid heads, and fully hit the trapezius muscles. "The two basic exercises for the deltoids are various kinds of shoulder presses, and a number of different lateral raises. The standard overhead press, in which a barbell is lifted from chest height straight overhead obviously works the heads of the deltoids in a slightly different way than does a press behind the neck. I like to both, sometimes in alternate workouts." Arnold also employs dumbbell presses in his shoulder routines. To give him a different effect than he gets in the barbell press, he takes pains to lower the dumbbells several inches below the bottom position of the barbell movement, and to bring them together at the top. This promotes a greater range of motion. "One mistake I see bodybuilders make frequently in doing a press is locking out every rep at the top. Once you lock your elbows you have taken most of the stress off the muscle. If you stop just below locking out you increase the effect of the exercise." 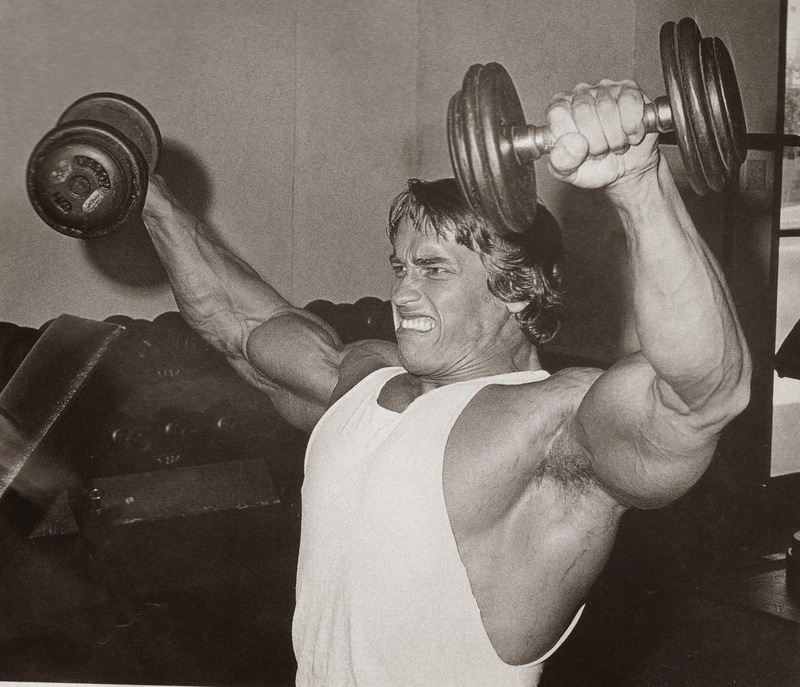 Arnold also uses another variation of the dumbbell press that he calls the Arnold Press. In this movement he begins by holding dumbbells as he would at the top of a dumbbell curl. Then he presses them upward, rotating his thumbs inward. This gives him an exercise that's part press and part lateral, and which works both the anterior and medial heads. "Laterals are great because, depending on what plane you confine the movement to, you can work any part of the deltoid you wish. Dumbbell front laterals work the front, side laterals the side, and bent laterals the rear." Arnold also does a movement called Lying Side Laterals, in which he lies on his side on an abdominal board and raises a dumbbell from this position. He may not have invented this exercise, but when he first came to California a lot of people who'd never performed the movement before were suddenly doing lying side laterals. One bodybuilder theorized that Arnold liked to make up new movements just to show that other people in the gym were copying him. However, this particular movement is one that he really believes in and practices. "Cable exercises add even more variety to your shoulder workouts. One-arm side cable laterals give you a constant tension throughout the movement. You can have the cable cross in front of you or behind you, and each approach has a different feel. In fact, there are a numerous kinds of shoulder lifts you can do to increase the effect of your shoulder workout." 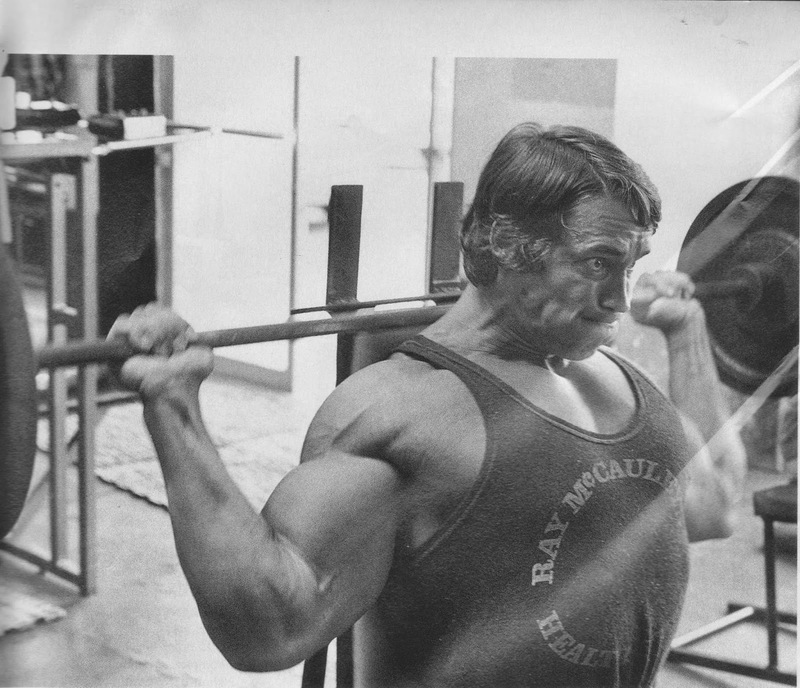 For trap development Arnold relies on four basic exercises - power pulls, cleans, upright rows, and shoulder shrugs. "Cleaning a weight involves a good, satisfying effort of coordination, but you shouldn't start out with too heavy a weight. For power pulls you can go for more weight, because you're essentially doing cleans but not letting the weight get above your chest or below your waist. "When you do upright rows I think it's important to keep the movement smooth and slow. Don't go jerking the weight up or letting it drop. And with shrugs an awful lot of bodybuilders use too much weight. They don't lift the shoulders as high as possible because of this. It doesn't do much good to lift a huge weight and only complete half the movement in this case." Using a split routine, Arnold likes to train shoulders and arms together, working the shoulders first. Because the deltoid-trapezius complex is such a complicated muscle group structure he does more sets than many other bodybuilders - as many as 50 sets in some cases, but at least 30-35 in a normal workout. "I know there's a lot of talk about needing only five sets for a bodypart. Still, I just don't see how, as a bodybuilder, you can train your entire shoulder area with just five sets. If you consider that the deltoids are really three muscles and the traps are about as complex, you're really training six different bodyparts, and six multiplied by five equals 30 sets." But Arnold realizes that the kind of routine that is right for him might not be best for everyone. A beginner, for example, should not try to equal the amount of energy Arnold puts into his training. "I like to see a beginner take his time to build up his strength and stamina. For example, one way to really get the delts to respond is to work with lighter weights and do more reps per set. Pump the blood through those muscles and get them to come alive. And don't try to do too many different kinds of exercises in one workout. Doing an overhead press, standing laterals, bent laterals, upright rows and shrugs is plenty. When you're going for growth, don't hurry to get into supersetting. You grow more just doing straight sets. "Working to perfect your shoulder workouts can make the difference between so-so and first rate. Look at how we think of shoulders. You 'shoulder a burden' . . . someone has 'the world on his shoulders' . . . you put your 'shoulder to the wheel.' This tradition has stayed alive since the ancient Greeks for a reason. Powerful shoulders are fundamental to a powerful physique.